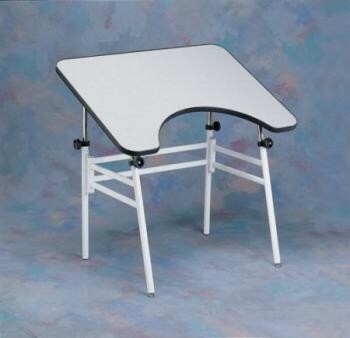 Height of table adjusts from 740 to 1120mm (29 to 44") and table top angles from 0° to 45°. Scratch resistant grey laminate top measures 760 to 1070mm (30 x 42") with wheelchair cut-out. A raised edge around the table top prevents items from sliding off.